George R.R. Martin wrote recently that "finding and nurturing new talent is one of an editor's most important tasks." We agree, but when we wrote our recommendations for 2016 Best Editor Hugo (short form) we didn't have data to make it easy to evaluate that. 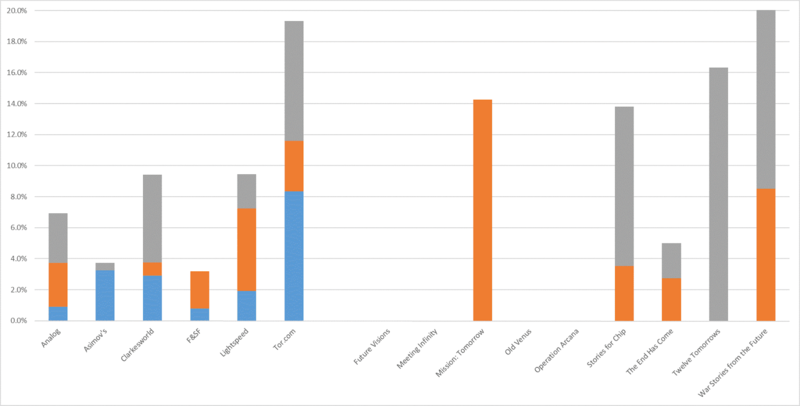 Now that we've published our recommendation page for the 2016 Campbell Awards, we can analyze the data to see which magazines and anthologies gave the most support to new writers, where "new" means "eligible for the Campbell Award." These are writers whose first professional SF/F publication was in 2014 or 2015. 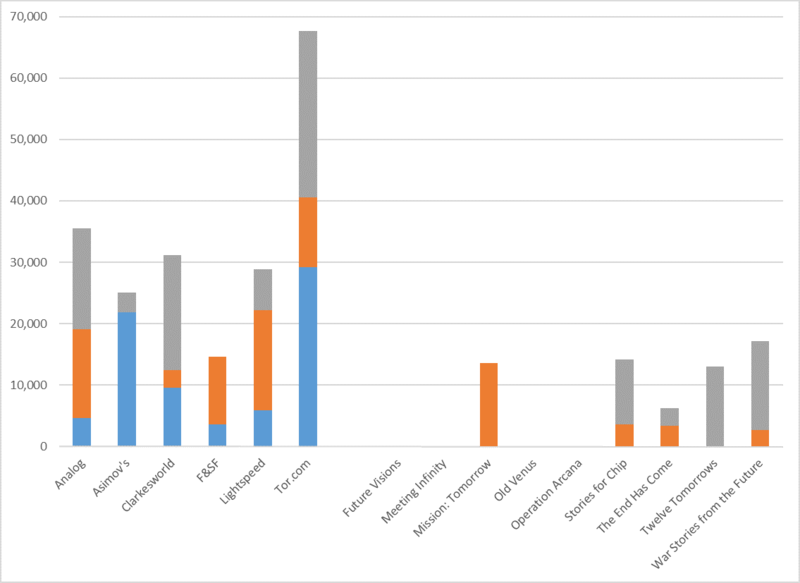 We'll look at which science fiction and fantasy venues published the most short fiction in 2015 (by various measures), and we'll discuss which editors seem to have done the most. We'll also take a look at whether new writers get treated any differently from established ones. The color coding is the same as we used in the recommendations for 2016 Best Editor (short form). Blue is recommended, orange is ordinary, and gray is recommended against. Some anthologies don't accept new authors at all. War Stories from the Future was the work of an editor who never did SF before and included many writers who never wrote SF before. Asimov's and F&SF each printed only four stories by new writers in 2015. People who read our Best-Editor article will note that we have not tried to separate the individual Tor editors here. That's because of the eligible editors, only one edited a story (exactly one story) by a new writer. Tor.com published a lot of fiction by new writers, but they were edited by new editors, who aren't eligible for the Best Editor (short form) Hugo Award. Now let's look at the same data but in terms of total number of words, not total number of stories. Tor.com published an enormous amount of fiction by new authors. In quantity of words published, there's not really that much difference between Analog, Asimov's, Clarkesworld, and Lightspeed as far as new writers go. F&SF published very little fiction by new authors by either measure. Of course it's one thing to see that a magazine published a lot of work by new authors, but it's also important to see how that compares to the total amount of original fiction it published. 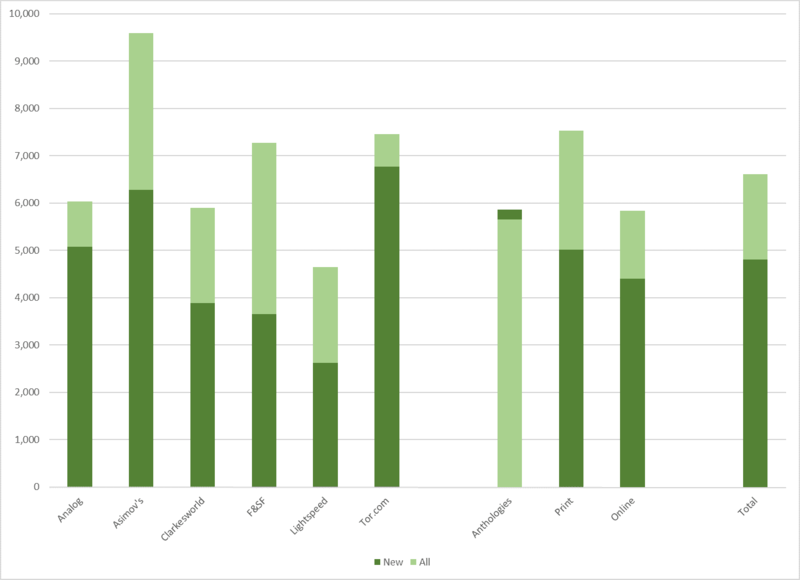 This chart rescales the previous graph in terms of the percentage of words of new fiction that each magazine or anthology printed which were devoted to works by new authors. Tor still dominates. Nearly 20% of Tor's original fiction in 2015 was from new authors. In percentage terms, Asimov's looks as bad for new writers as F&SF does; they just publish a lot of content in general. The anthologies don't look at all unfriendly to new writers, not counting the ones that didn't accept new authors at all. We had to cut the chart off at 20%; 70% of War Stories from the Future is actually new authors. We're a little hesitant about suggesting people use this information to adjust their choices for Best Editor (short form) for a couple of reasons. The editors who did the most to promote new talent may be at publications we didn't read in 2015. Because the number of new writers is so small, these results don't all have statistical significance. 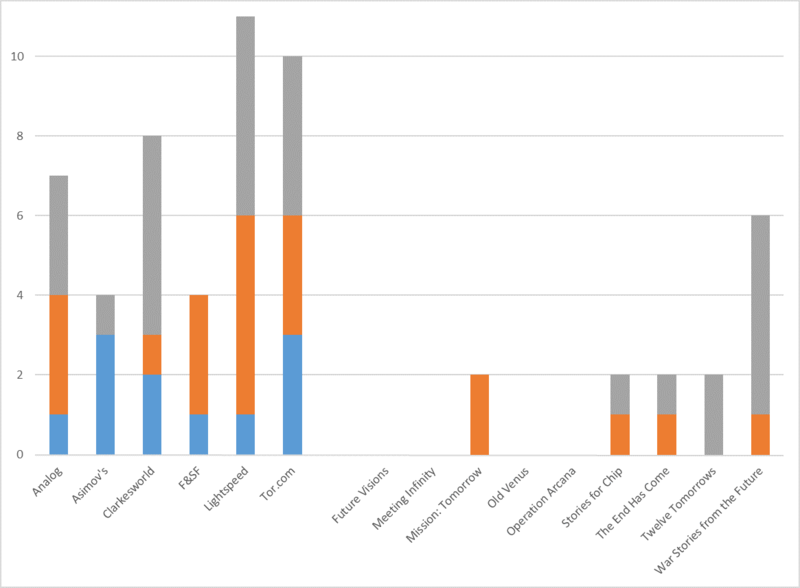 Asimov's and F&SF were definitely much harder for new authors than Clarkesworld, Lightspeed, and Tor.com, but beyond that the ordering is really uncertain. Since John Joseph Adams was the editor for both Lightspeed and The End Has Come, he unquestionably made the biggest difference to new authors of the editors we actually covered, with Neil Clarke coming second. Fans who think developing new talent is important should definitely consider rewarding those two when they make nominations. That's probably as much as we can really say with confidence, based on this data--as far as Best Editor (short form) goes, anyway. There are a few other statistics in the data that are of general interest, even if they don't help with Hugo nominations, so we'll share those too. Do Magazines Treat New Writers Differently? Now let's look at the six magazines alone and see if there seems to be a difference between new authors vs. established ones. The first thing we'll look at is length of stories. The next chart shows the average length of all published stories and compares it to the average length of stories published by new writers. All of the magazines chose shorter stories from new writers on average. Asimov's averages longer stories in general, and it averages longer stories from new writers than anyone else but Tor.com. Tor and Analog seem to treat new authors almost the same as old ones--as far as length goes, anyway. Lightspeed's overall numbers are distorted by all the flash fiction in their "Queers Destroy SF" issue, but even so, they seem to favor much shorter stories for new authors. For anthologies (taken together) there was essentially no difference. The effect is somewhat stronger for print than online magazines. We're quite sure the magazines aren't treating new and established writers differently (we checked with a couple of editors to verify that), so we really don't have any explanation for this phenomenon. We'd love to hear people's ideas. The last question is what sort of quality the different magazines expect from new authors. 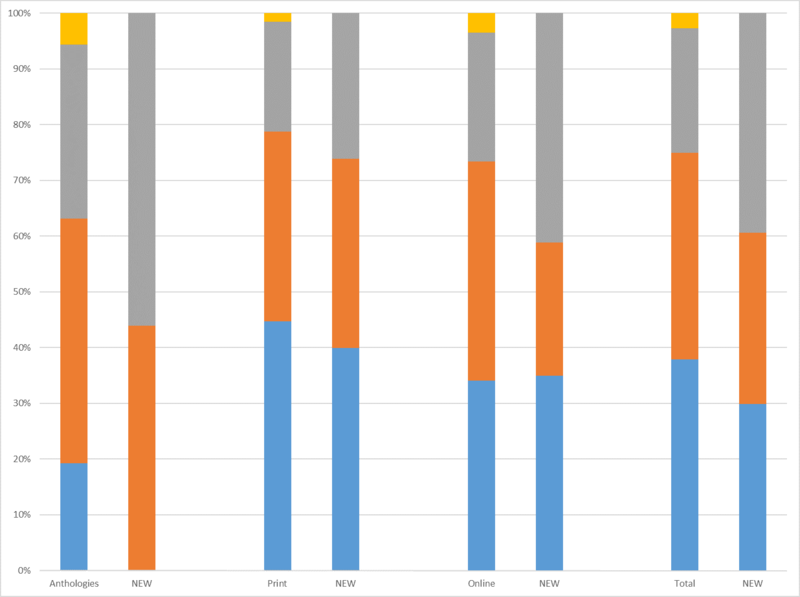 The next chart compares quality across all authors vs. quality just for new ones. Each pair of bars represents a single source of stories. The left-hand one is the distribution for all authors while the right-hand one (labeled "NEW") is just for the new ones. The golden regions at the top represent stories that weren't science fiction or fantasy at all. We have no idea why the scores for new authors in anthologies were so much worse. We'd be interested to hear other people's speculations on that. For the magazines, using either quality measure (read our 2016 Editors (Short Form) article for definitions), stories from new authors were slightly lower quality than those from established authors. One would expect new writers to not be quite as good as established ones, but the difference is surprisingly small. That's consistent with the editors' claims that they treat all writers the same. That is, although most new writers may not be very good, the new writers who are good enough to get out of the slush-pile average only slightly worse than established writers. Our data are weaker for this than anything else we've analyzed, owing to the fact that magazines we didn't read in 2015 unquestionably accounted for a huge number of new writers and because the total number of new writers is small enough that it's hard to get statistical significance. Nevertheless, two editors, John Joseph Adams and Neil Clarke, do stand out, as does Tor.com as a whole. For 2016, we're reading 11 magazines so we'll have a bigger data set to analyze a year from now. On January 7, 2016, Tor.com decided to accept no further unsolicited submissions, which presumably means they will publish few stories by new writers in the future. That's a shame because in 2015 they printed the most new-author fiction of anyone by far. Interesting stuff. As you note, it may be that other venues are also doing well on this front – I have names on my Campbell longlist from Strange Horizons and Uncanny, for example. It was good to see that all of the “Big 6” are taking chances to some extent. I'm not surprised at John Joseph Adams coming out well. I suspect that one of the underlying aims of tor.com as a site is to find and develop potential new authors for Tor editors, so their apparent risk-taking is quite understandable. I'm still puzzling over why new writers' stories average 1,000 words shorter online and 2,000 words shorter in print.